Investors love to contribute and use Roth funds because of their tax-free growth. The trouble is you’re typically limited in how much you can contribute to a Roth IRA. Contributions to Roth IRA have a ceiling of $6,000 per year. The Solo 401k Roth limits are much higher at $19,000 but still – what if you could get more after-tax dollars to grow tax free? Enter the Mega Backdoor Roth IRA using the Solo 401k plan. The mega backdoor Roth Solo 401k allows you to contribute more after-tax dollars than you would in a normal Roth IRA. By contributing money into the Solo 401k plan, you can convert those dollars to Roth funds. Once the funds are converted you can roll the Roth funds into a Roth IRA. The result is that you can eventually take the funds out of the Roth IRA without tax penalty. The IRS recognizes the Mega Backdoor Roth as a legitimate strategy. In 2014 they released guidance on documenting after-tax contributions. The strategy grew out of the original backdoor Roth IRA conversion where investors would take contributions to their 401k or traditional IRA, convert them to Roth (and pay the taxes) and then roll those Roth funds into a Roth IRA. This is an especially valuable strategy for high-earners who don’t qualify to contribute directly to a Roth IRA or those who want to get more savings and assets into a Roth IRA structure. Disclaimer: This is a complex strategy that requires meticulous calculation and excellent documentation. The Nabers Group Solo 401k plan allows for all elements of the mega backdoor Roth Solo 401k. However, we recommend you get help from your CPA or tax advisor before executing this strategy to ensure it’s done properly. Your Nabers Group Solo 401k contains all the elements needed for a mega backdoor Roth Solo 401k option. Decide how much you’d like to get into the Roth IRA through the mega backdoor Solo 401k strategy. Then, allocate how much will be a Roth contribution (if any) and how much will be a voluntary after-tax contribution. Roth 401k contributions can roll into a Roth IRA almost any time. Voluntary after-tax contributions are converted to Roth funds once they are in the plan. Converting after-tax contributions to Roth is not a taxable event as the funds are already after-tax. Rather, you are re-classifying the voluntary after-tax contributions to Roth funds. IMPORTANT: Keep in mind that once you convert/re-classify your voluntary after-tax contributions to Roth funds, they must follow the rules for Roth distributions in order to be qualified. Once you convert after-tax funds to Roth, they cannot be turned back! 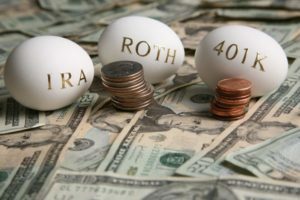 After you have contributed Roth or after-tax dollars to your Solo 401k plan, and the after-tax contributions are converted to be Roth funds, those funds can then roll into a Roth IRA. The result? Instead of making $6,00 in Roth IRA contributions, you can make up to $56,000 in mega backdoor Roth IRA contributions. That’s almost a ten-fold difference in Roth IRA funds! This strategy is a great fit for a Solopreneur making more than $56,000 but less than $86,000 in business revenue. This revenue is per participant (example: husband makes about $60,000 from the business, wife makes about $60,000 from the business). The reason for the revenue sweet spot is the following: If you’re a high earner, you may be more tax advantaged to simply stick with traditional (pre-tax) contributions and max out at $56,000 per year (or $62,000 per year if you are age 50 or older). If you’re earning less in your business, but want to contribute more than would typically be allowed through normal channels – this strategy can make sense for you. Remember, if you’re a sole proprietor or single-member LLC, this income is the business revenue subtracting expenses. Use your W2 income if your business is an S-Corp/C-Corp or LLC with S-corp taxation status. The mega backdoor Roth strategy can be a powerful tool for growing your Roth funds. When executed properly, you can position yourself for tax-free distributions from your retirement plan. This is an excellent aggressive wealth tool because you will pay less in taxes in the long-run. However, always work with your tax advisor to ensure proper reporting and filing of forms documenting the conversion of Roth funds.